The pig-nosed turtle is known by many names such as the Fly River turtle and pitted shell turtle. Their species spans back to 70 million years before the extinction of dinosaurs, making them utterly ancient. They are also the last survivors of their family, which makes them highly exotic. 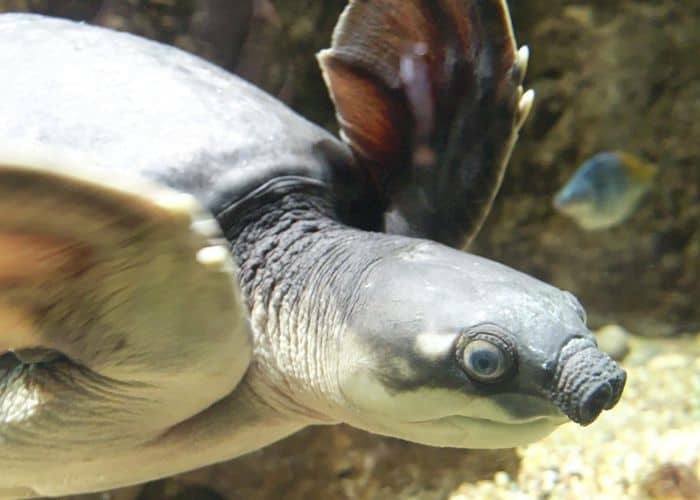 Their nose resembles a pig, and despite being a freshwater turtle, they have flippers like sea turtles. These characteristics make them very unique and set them apart from the rest of the freshwater turtle species. Their shell boasts a leather-like texture, generally olive in color. Unlike many turtles, they have an extremely hard shell. It can be deceiving to predators because of its leathery exterior, but it is very solid underneath. 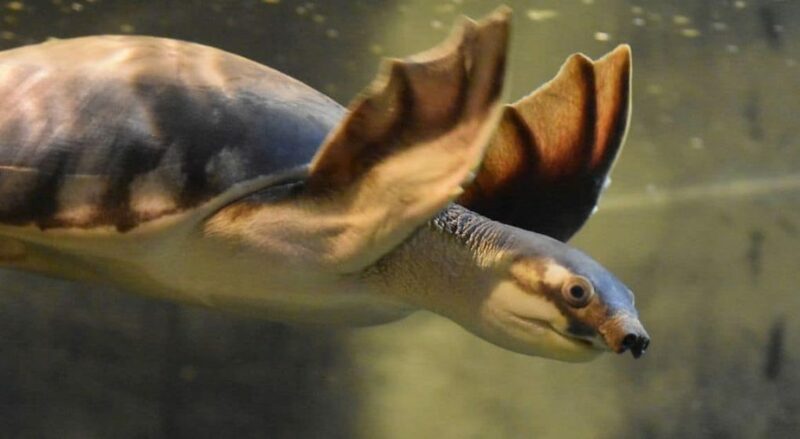 The shell protects the adult pig-nosed turtles from all types of predators and threats, which is probably why they have even outlived the dinosaurs by 70 million years. They are an extremely rare species, and not many people have even seen one in the flesh, yet they are quite famous because of their distinctive look. So much so, that there are companies selling curtains and even posters of this exquisite animal. The pig-nosed turtle is scientifically called Carettochelys insculpta. It belongs to the family Carettochelyidae, and as mentioned above, it is the last surviving member of its family. The order they belong to is testudines,’ and their current population is unknown. They are native to New Guinea and Australia, and they are distributed across the southern and northern regions respectively. Their unique shape comes due to their pig-like nose, which is used as a snorkel for finding food and breathing underwater. They are called fly-river turtles as well due to the river in Papua New Guinea where they are commonly found. Because of their nose, pig-nosed turtles have a very sharp sense of smell. Due to their flippers, they resemble sea turtles instead of freshwater turtles. They grow as large as 28 inches and weigh as much as 20 kilograms. Their average life span is 30 years. Pig-nosed turtles are essentially omnivores, but they prefer eating vegetation to carnivorous meals. One of their favorite things to munch on are figs and their leaves. They eat molluscs and other insects as well. Due to their herbivorous tendency, they eat all sorts of fruits and leaves that grow around riverbanks. They eat worms and small fish as well, which they track using their nose as a snorkel. I you happen to have a pig nosed turtle UltraFresh makes a nice mix of prawns and shrimp paste that is good for their diet. As mentioned above, the nose-pig turtles are mostly found in Papua New Guinea and Northern Australia. They are aquatic creatures that only leave the water to lay eggs during breeding season. They are found in fresh-water bodies despite their sea turtle like flippers. Rivers, lakes, and streams are their natural habitat because the water is fresh, and they can find plenty of small fish and insects to eat. They have also been known to hide in marshes and swamps. Because of their aquatic nature, they go as deep as 20 feet underwater in search of prey and shelter. Apart from Australia and New Guinea, some pig-nosed turtles have also been sighted in Indonesia. What Predators Do Pig Nosed Turtles Have? There are many threats to their existence, but the biggest predator of pig-nosed turtles are crocodiles and alligators. Snakes, lizards, and pigs have been known to steal and eat their eggs as well as stomp on them, but they do not prey on adults. In Papua New Guinea, their meat and eggs are considered a delicacy, which is also a threat they face due to their decreasing population. Is The Pig Nosed Turtle Endangered? Pig nosed turtles were once considered very rare and still are considered a vulnerable species. They are few in number but not enough to be classified as endangered. Their populations have been decreasing in some areas, but both countries native to this turtle are taking steps to ensure that they increase in number. They are forbidden to be sold in fish markets, but they are still killed in some areas as they are considered a delicacy. Pig nosed turtles become mature enough to breed at around 16-18 years of age. Females generally take longer than males to reach sexual maturity. Females lay eggs in the dry season. They leave the water to find a dry area where they lay and bury their eggs. On average, the clutch consists of as many as 35 eggs. The nests are dug almost 5 meters from the bank, making it easier for hatchlings to reach the water when they are born. The female lays the eggs at night to avoid predators, digs the nest and goes back into the water. Because the nest is not protected, it leaves the eggs prone to predators and stomping. The incubation period is between 2 and 3 months. This varies depending on the rainfall. Even if the eggs are ready, they will not hatch until there is a heavy rainfall and most eggs hatch around midnight as well. Pig-nose turtles are very high maintenance pets in captivity. Because they are still low in numbers, it is advised that only people with experience in turtle handling keep them. They are aggressive in behavior especially when it comes to territories. They are demanding in terms of food and quite moody. They also require large ponds or aquariums due to their large size, and fully aquatic nature. It is also advised that they should not be handled too much as they prefer to stay in the water. They are also quite prone to sickness and require a pH of around 7.2 to be maintained in the water. Due to all these facts, they are a very complex pet to keep. If you are looking to get a pig-nosed turtle, it will take a lot of time to find one. They are quite rare due to the decrease in numbers as well as legislation in place to protect them. What are your thoughts about the pig nosed turtle? If you own one, we would love to hear your opinions in the comments section. If you would like to know more or have specific questions, feel free to ask us.